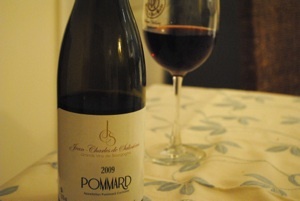 Last Saturday night our son went out with friends, and my husband and I had an evening on our own. We toyed with the idea of going out for dinner, but we are lucky to have the opportunity to eat out a lot, so the idea didn’t hold as much appeal as it might have done. 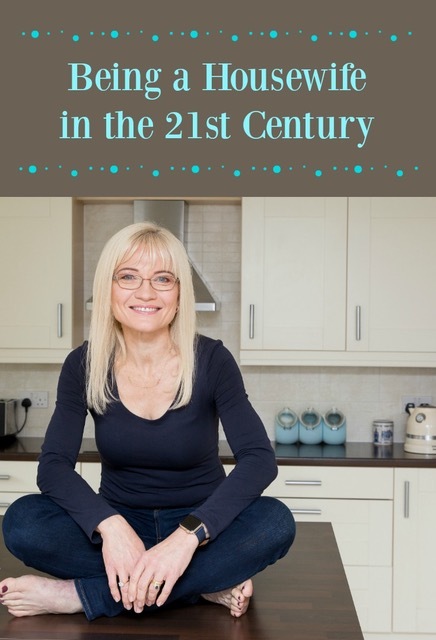 In fact, after a very busy week, all we really wanted to do was curl up in front of the television with each other and a plate of something comforting and delicious – Mushroom Bacon and Garlic Spaghetti. 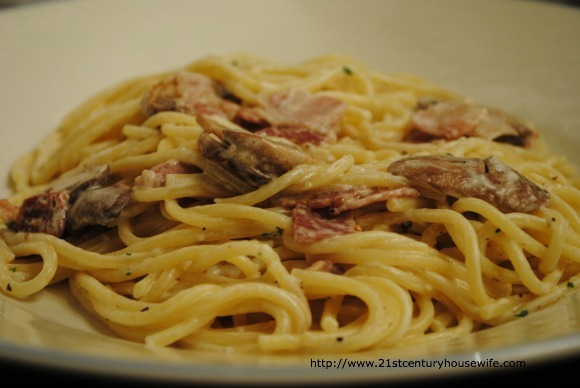 One of the first meals my husband ever cooked for me was his Tagliatelle with Bacon and Cream. It’s not very heart healthy, but it’s easy and delicious. I didn’t have any tagliatelle and I wanted something with a bit more to it than just bacon and cream, so I decided to get creative while remaining true to his already delicious recipe. This Mushroom Bacon and Garlic Spaghetti recipe was the result. I heated up the oil in a large frying pan over medium heat. 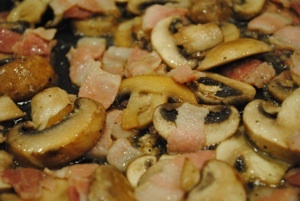 Using clean scissors I chopped up the bacon and fried it with the mushrooms until they began to soften. I also put a big pan of water on to boil for the pasta. I peeled the garlic cloves and grated them in on top of the bacon and mushrooms while they were cooking, stirring them fairly often to prevent any sticking. My husband opened up a lovely bottle of wine and set up some tables in the living room. While the bacon and mushrooms finished cooking, I salted the pasta water and cooked enough dried spaghetti for the two of us (about a fistful). You could also use fresh pasta to make this dish even quicker and easier. 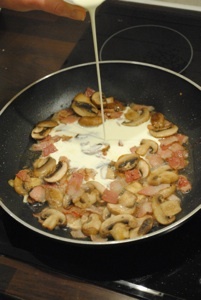 I then sprinkled the oregano and parsley into the frying pan with the bacon and mushrooms. I added a good grating some freshly ground black pepper and stirred everything through. At this point, I added the single cream a bit at a time (that’s light cream in the US), stirring it as I went, to get a nice amount of sauce. I used about half a cup in the end. I let it continue to heat while the pasta finished cooking, stirring occasionally. After draining the pasta, I stirred the creamy garlicky bacon and mushroom mixture through it, tasted the Bacon Mushroom and Garlic Spaghetti for seasoning and piled it into warmed bowls. 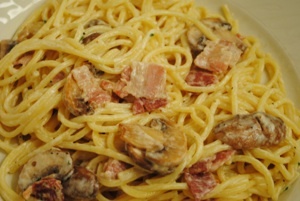 In less than twenty minutes, we were relaxing on the sofa with Creamy Mushroom Bacon and Garlic Spaghetti. It was one of the nicest evenings of the whole week. Chop up the bacon using clean scissors. Sauté the mushroom and bacon, stirring frequently. Grate in the garlic and continue to cook. Meanwhile, put a big pan of water on to boil for the pasta. When the water comes to the boil, salt it and cook the pasta according to package directions. While the pasta is cooking, sprinkle the oregano and parsley into the frying pan with the bacon and mushrooms. Add a good grating some freshly ground black pepper and stir. Add the single cream a bit at a time, stirring as you go, to give a nice sauce. You may need more or less cream than is called for. Drain the pasta and stir the the creamy garlicky bacon and mushroom mixture through it, taste for seasoning and serve in warm bowls.